Updated February 2019 -- please see the footnote 1 at the bottom of this page concerning AVGAS. You have come to the right page if you want facts and references rather than rumors and unsubstantiated assertions from most blogs and the endless misinformation published by paramotor marketing departments. This page is updated regularly due to new information that comes in from users and manufacturers. Fueling equipment You will need the right equipment to mix, store, and transfer your fuel. Please see "Equipment" for information on what you need. Metal containers are the best for storing gasoline because, unlike plastic, UV from sunlight cannot penetrate metal. UV causes any kind of gasoline to deteriorate. If you do use plastic jugs, especially clear ones, store them in a cool, dark place. USE ONLY HIGH QUALITY APPROVED OILS! SEE OILS BELOW. Simonini 200cc – The factory version of this engine has special fuel and oil requirements because of different tuning than the Fresh Breeze version. Type of gasoline – Remember that CHEAP OR OLD GASOLINE CAN RUIN ENGINES, ESPECIALLY WHEN RUN AT OR NEAR SEA LEVEL. Make certain that the gasoline is fresh (less than 30 days old). Old fuel causes performance and running problems. Fuel preservative helps but it is still better to have everything fresh. Our workbench is full of burned out engines, half of which were ruined because of cheap and/or old fuel. Aviation gasoline (AVGAS) with the anti-fouling TCP or Decalin RunUp fuel additive. Decalin is substantially less expensive but is not approved for use in certified aircraft engines, experimental only (i.e. for ultralights). Unleaded premium gasoline with ethanol <10%. To be safe, use semi-synthetic oil with ethanol fuels (some synthetics do not mix well with ethanol fuels). If you must use fuel with ethanol, follow the instructions below. Ignore anything said by Miniplane concerning >10% ethanol blends (see below for the reasons why if you live in the U.S. or other areas in the Western Hemisphere). Premixed racing fuel – Pilots who cannot find ethanol-free gasoline or AVGAS can purchase ready-to-use, pre-mixed fuel made by VP Racing Fuels. These fuels are 94 octane and use JASO-FD full synthetic oil. They have 50:1 and 40:1 mixes available. Most major distributors, including Wal-Mart and Home Depot, stock these premixed fuels but they are not cheap. VP Racing fuels contain stabilizers so that the containers can be opened, exposed to the air yet the fuel will remain fresh for a year. Accordingly, additives are used to prevent the deterioration of the oil that has been mixed with the gasoline. Type of Oil – semi-synthetic and full synthetic oils should meet the JASO FD specifications. (An exception is Amsoil's Dominator which does not meet the JASO-FD standards for emissions.) Here are some oils available in the U.S. that state they meet this rating. Lucas and Motul oils are available from BikeBandit. Amsoil oil is sold in most motorcycle shops. 2. Semi-synthetic 2 stroke oil: Bel-Ray SL-2 Semi-Synthetic 2T Engine Oil; Fuchs Silkolene Comp 2 ester based semi synthetic; Lucas Semi-Synthetic 2-Cycle Oil; Motul 510 2T; Shell Advance VSX 2; Spectro Golden 2T Injector; SynGard Use semi-synthetic 2 stroke oil with ethanol gasoline blends. It is the best because it burns with the least amount of deposits but only if it is fresh (<30 days old). Briefly, all automotive gasoline (MOGAS) is like milk: It starts to spoil the minute it is made at the refinery or comes from the cow, respectively. How old is the fuel at the pump? High volume stations will have fresher fuel. But, you will never really know. (Please see "Fresh fuel only" below for more information on this.) Modern automobiles will run on just about any concoction unleaded gasoline even fuel that is months old. Of course, the presence of ethanol makes things much worse. Second, fuel [except AVGAS] evaporates and loses its octane rating when it lays in your aircraft’s fuel tank or in a plastic jug. A “premium”, 91 octane fuel will see its octane rating reduced to unusable levels after as little as three weeks. Fuel with a lower octane rating would obviously have an even shorter usable life. Solo and NIRVANA recommend using 100% synthetic Castrol TTS in correct oil/petrol mixture, which prevents combustion chamber and exhaust carbonization. Do not store mixed petrol longer than a few days, max 2 – 3 weeks. You can mix Castrol TTS with leaded or unleaded petrol. However leaded petrol is preferred. Always use quality petrol. AVGAS is the best fuel if your ambient air temperature is over 100 degrees F, as it is where we fly. However, AVGAS is not easily available to paramotor pilots in Europe so they often must use the ethanol blends – and suffer the problems of ethanol. Simonini actually warns pilots to use only semi-synthetic oil in their engines but this is because AVGAS is not easily available – except in the U. S. and other non-European countries. 1. It has the highest octane of all gasoline. This, alone, makes AVGAS preferable. The higher the octane, the less damaging pre-ignition there will be in high compression ratio engines, like paramotors. Ordinary automobile fuel oxidizes quickly and, as a consequence, its octane value drops quickly in just weeks during storage. 2. It contains the octane enhancing compound tetraethyl lead. When this compound is burned, it forms lead monoxide deposits which coat various parts of the combustion chamber, especially the spark plug. According to the multi-cylinder aviation engine manufacturer ROTAX, lead monoxide deposits can damage the crankshaft bearings due to the deposits flaking off from the combustion chamber and then being sucked back into the crankcase in their multi-piston two stroke engines. This is something that is difficult or impossible to occur in single cylinder paramotor engines. Furthermore, the use of the TCP or Decalin RunUp anti-fouling additive scavenges the tetraethyl lead in the fuel and coverts it to lead phosphate, a harmless substance that will not affect bearings. Some claim that ring sticking is more common from the additional lead deposits in AVGAS than from the carbon deposits created by the use of any fuel. There is no proof of this. Ring sticking is caused by cheap oil and/or engine overheating, regardless of whether the fuel is leaded or unleaded. Suffice it to say, overheating is the most common problem in engines which are not properly maintained. Red Line, a manufacturer of 2 stroke synthetic oil lubricants, notes what happens in one of their technical documents, "The time indicated [in the graph] is the time required for the lubricant to decompose to a sticky mass capable of sticking a two-cycle piston ring." 3. It is the most stable of all gasoline and can be stored for long periods (years). 4. Because of its high quality, it is less likely to cause vapor lock or fizz, a serious conditions that causes fuel starvation resulting in engine overheating. 5. It will not harm fuel system parts (despite the unsubstantiated claims by Miniplane) as does gasoline containing ethanol. 6. Cost is about double that of premium unleaded, unfortunately. 7. It mixes well with all types of (2) stroke oil. 8. It does cause increased fouling of spark plugs and, to a lesser extent, results in more deposits in the combustion chamber, especially on the top of the piston. This is remedied by the use of approved fuel additives. 9. It is the purest of all types of gasoline. AVGAS problems? There are some competent mechanics who flat-out state that AVGAS will ruin paramotor engines. Yours truly wishes he could know the circumstances under which they believe engines were harmed. We have used AVGAS for over a decade in our group here and so appreciate its stability and quality. Maybe it's the lead fouling and/or mixing AVGAS with inexpensive two stroke oils that caused the problems? Addition of the TCP or Decalin RunUp additive eliminates the fouling problem so that cannot be a reason. If Fresh Breeze and Nirvana Solo prefer that AVGAS be used in their 2 stroke paramotors, what can the issue be? Where to purchase AVGAS? Please review this article on airport access for ultralights for where and how to purchase AVGAS. Fuel treatment for AVGAS is a good idea. If AVGAS is treated with the additive TCP or Decalin RunUp, the problem of lead fouling is alleviated. A quart of TCP (cost <$40 US) will treat 320 gallons. A quart of Decalin costs $35 and will treat up to 640 gallons, depending on the engine. For TCP, this comes out to about $ 0.13/gal, and is well worth it, considering that less engine maintenance will be needed. For info on how TCP works, read this pamphlet from Alcor, the manufacturer. The active chemical in these additives is known as a lead scavenger. During combustion, the tetraethyl lead is converted into lead phosphate instead of into lead monoxide. Lead phosphate is a non-conductive compound that does not foul spark plugs. Rather than build up on the piston, spark plug, and other engine parts, lead phosphate is carried harmlessly out in the exhaust stream. Just the same, there may be some small presence of lead monoxide on engine parts but it is minimal. Below is a Thor 130 engine with approximately 130 hours of run time. AVGAS was used exclusively in this engine without any anti-fouling additives. The cylinder head is nearly 100% free of any lead deposits. Lead deposits do not tend to form on the cooler internal parts of the combustion chamber, like the cylinder head here. The red arrows point to small flakes of lead monoxide that were probably lodged on the edges of spark plug and broke off when the plug was removed. They are soft and harmless in single cylinder 2 stroke engines and are expelled with the exhaust when they break free from engine parts. Note that the spark plug is covered with lead monoxide deposits (light yellow in color). Large 4 stroke aircraft engines have expensive spark plugs that get just as fouled as the plug in this photo. On the other hand, our plugs cost a few dollars and are easy to replace. Here is the same engine with a view of the top of the piston. It runs much hotter than the cylinder head and has more lead deposits. However, even after 130 hours, these deposits are minimal. If the pilot had used an anti-fouling additive for lead deposits, he probably would not have had to clean the piston. 10 minutes with a razor blade took care of the carbon and lead deposits in this engine. This is another photo of the same engine as above. Typical in paramotor engines run with untreated AVGAS, the spark plug has the most lead fouling. This plug has about 50% more life left but should be replaced because it is badly fouled. As general aviation engines, lead fouling can short out a spark plug. Below is a spark plug from an engine that used AVGAS treated with the TCP additive. The plug has about 25 hours on it and is at the end of its life. It has a trace of lead monoxide deposits which is normal. Even a plug exposed to lead-free fuel would have had some deposits after 25 hours. 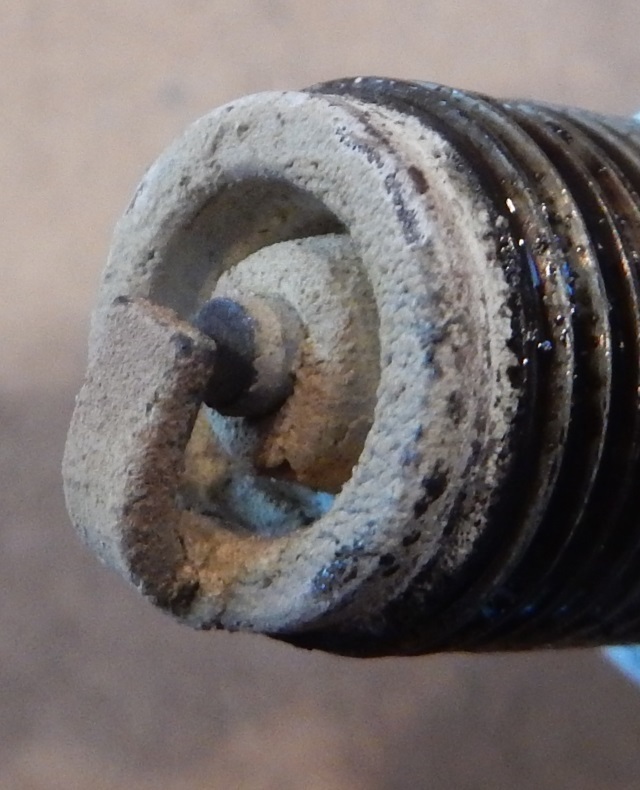 This spark plug is from an AVGAS burning engine that did not have an anti-lead fouling additive mixed in. Note that lead monoxide is present close to the grounded electrode and absent from the cooler parts of the plug. The cylinder head had no lead deposits and the piston had minimal deposits. The only symptom the engine had was hard-starting because the plug is worn out. Engines that use ethanol blends will not last as long and why any other kind of fuel is preferable. Regardless of what kind of fuel is used, the spark plug will wear out and/or foul. It is so inexpensive to change out the spark plug and improve starting and high end performance and is why it should always be done. Here is a another spark plug from a Polini Thor 130 used for tandem flying (it ran at full throttle most of the time). AVGAS treated with the TCP additive was used in this engine. From tests, it appears that engines run under heavy load will have less lead monoxide fouling, like this one. It has about 30 hours on it and is at the end of its life. Even so, the plug has a light fouling of (white) lead phosphate, the byproduct of the chemical action of the TCP additive on tetraethyl lead. The cylinder head and piston crown will have little if any fouling. Compare the plug below with the plug above. Both engines had about the same number of hours on their respective plugs. It shows what a difference the TCP fuel additive makes. The engine manufacturers continue to issue warnings about the problems with fuels containing ethanol. Ethanol, in a word, rots fuel system parts from the inside out, especially metal and most plastics. It also attracts moisture. As the marine and kart racing guys note, ethanol-free gasoline should be made available for off-road users. Walbro (who makes most of the carburetors for paramotors) has this warning. Note: Walbro removed this page from their site, probably to avoid blackmail from the radical environmentalists who are offended with the truth of what a disaster ethanol is. A lot of farmers are making a bundle from it. What is the cost in petroleum fuels that are required to distill the ethanol? The stuff is manufactured exactly the same way whiskey is but the latter tastes better. The simple fact is, ethanol in gasoline can damage Your fuel system. Gasoline which is organic will begin to decay due to high amounts of oxygen in fuel containing ethanol. Ethanol containing fuel will also absorb moisture from the air because ethanol is hygroscopic and will attract moisture. This added moisture can lead to phase separation. With phase separation comes corrosion to critical engine and fuel system components. The fuel system can also be impacted by contaminants carried in the gasoline itself, as well as gasoline containing ethanol. When used in mowers and other power equipment, ethanol can lead to higher operating temperatures, erratic running, and engine-part failure. Ethanol fuels should be avoided, if possible. Automotive gasoline that contains ethanol should only be purchased from a major company, like EXXON, ESSO, BP, Chevron or Shell, because their fuels contain important additives, especially detergents, that lessen the buildup of carbon inside the cylinder and gunk in the fuel system caused by the presence of ethanol. Lesser grades of fuel can be used but Miniplane notes that you may have higher running temperatures i.e. you may overheat your engine at higher loads and experience damage. WARNING: DO NOT USE GASOLINE WITH MORE THAN 10% ETHANOL. Miniplane claims that higher concentrations will not damage their engines but what about the Walbro carburetors used on all of their motors? If E85 works, then they should include an E85 fuel kit with their engines. Walbro notes on their webpage that gasoline containing more than 10% ethanol should not be used in their carburetors. Various U.S. oil makers (e.g. Bel-Ray) warn users not to mix their oils with ethanol blends greater than 10%. As every RC, go-kart, and dirt bike group in the world and the oil and paramotor manufacturers note, the Walbro carburetors that most engine use are NOT designed for fuels other than gasoline. Ethanol, for example, must have a lower fuel/air ratio because per volume it contains less energy than gasoline so ethanol configured carburetors have larger jetting, depending on the concentration of ethanol as Walbro notes in the warning above. 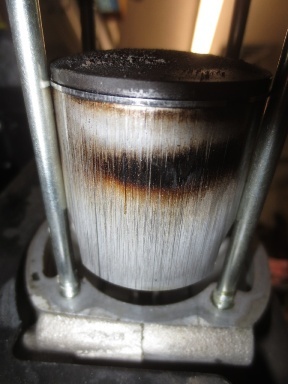 Here is a fuel filter that started to rust because of water in the fuel that was dissolved in the ethanol. Anyway, who wants to find out what happens if you use a 15% ethanol blend in your paramotor? Furthermore, the 2 stroke oils available in the U.S. and non-EU countries are different than those in the EU. Has Miniplane tested the U.S. oils? Not likely. Semi-synthetic vs. Full synthetic oils Some full synthetic oils do not mix well with gasoline that contains ethanol. This is because the gasoline-oil mixture begins to separate out when it sits in the fuel tank. Simonini notes this problem in their manual for the Mini 2 Plus with the Castrol Power RS TTS 2T oil. Other brands of full synthetic oils do not have this problem with gasoline containing ethanol. Fuel stabilizer Add Sta-Bil, SeaFoam, or an equivalent fuel treatment to help preserve ethanol blended fuels. Unless Chevron premium gasoline is used, it is helpful to add their Techron additive (or an equivalent) per the recommended amounts. This additive dissolves the gunk that ethanol creates. Fresh fuel If you are using premium (as you should), did you pump a few gallons into your vehicle first? If you do not do this, the fuel in your portable tank could be 50% regular grade fuel. Do NOT allow gasoline with ethanol to sit for more than a month in the fuel system as it can damage the metal and non-metal parts of the engine. If fuel stabilizer is used, blends can be stored in ordinary gasoline containers for many months IF NOT MIXED WITH OIL. If pilots store motors for more than a few weeks, they should purge the fuel lines and carburetor. Ethanol is a powerful solvent that causes non-metal fuel system parts (tubing, gaskets, diaphragms, filter material) to deteriorate. It can cause fuel lines to swell enough to allow the pickup tube filter in the fuel tank to fall off. Ethanol is hygroscopic and also conducts electricity. This causes electrolysis of the metal parts in the engine and is why those using two stroke engines in a marine environment have endless problems. The metering lever spring inside the Walbro carburetor will weaken from corrosion in the presence of ethanol blended fuels which is why it should be replaced every time the carburetor is rebuilt. Remember that fresh fuel (< 30 days old) is always better than old fuel, even when stabilizer is used. AVGAS, on the other hand, is manufactured to remain stable for years without the addition of any chemicals. Carburetor maintenance Regularly test the pop-off pressure of your carburetor because of corrosion and weakening of the pop-off spring caused by electrolysis and/or the presence of water that is mixed with the fuel. Testing the pop-off and, more importantly, the rest pressure is the only way to tell if the spring or ML valve seat is bad. Miniplane-USA stocks the springs. Low pop-off pressure dramatically affects the high-end output of an engine due to a richening of the fuel mixture. Rebuild the carburetor as often as needed. Once a year may not be enough. Water contamination Check that the gasoline does not contain either water (mixed in with the ethanol) or more than 10% ethanol. Wiki has a good article on the stability of gasoline, especially ethanol mixes, and what happens as these mixes age. Percent ethanol Test the ethanol percentage in the fuel. For about $10, pilots can buy an ethanol percent tester. If 10% ethanol fuel contains water the fuel tester will indicate an ethanol content <10%. This is another reason why pilots who live in humid parts of the world should not use ethanol fuels in their engines unless they are certain that it is not contaminated with water. For example, if you test fuel that is supposed to contain ethanol and the tester shows it to be ethanol free, the fuel has been fully saturated with water. Such fuel can ruin a 2 cycle engine. Air-fuel mixture Be sure that the engine is not overheating or running too rich. The Walbro Service manual notes that ethanol blends will cause carburetors designed for pure gasoline (like the WG8 and WB37) to run leaner and cause the engines to run hotter. This is another reason for pilots to install a cylinder head temperature gauge. Ethanol fuels require less oxygen than the same quantity of pure gasoline. This means that ethanol fuels may require different carburetor jetting i.e. a larger main jet size. This aspect of ethanol fuels is largely ignored. Recreational Power Engineering, the U.S. distributor of the 2 stroke Hirth engines, has these recommendations on fuel and oil for the Hirth engine. They warn against using ethanol fuels and synthetic oils in humid environments. 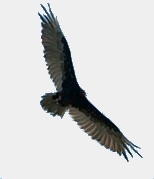 They approve the use of AVGAS if anti-lead fouling additives are used, like TCP or Decalin RunUp. Marine engines and small aircraft engines have much in common. MarineMechanic.com has this informative article on coping with the poor quality gasoline we have to use these days. They emphasize the importance of additives and making sure the engine is tuned up correctly and advice on how to reduce carbon buildup inside the engine. For paramotors this often translates into having "stuck" piston rings which quickly ruin the cylinder. Ethanol is a common additive to blend the fuels with, and while ethanol may not pose the environmental hazards of other gas additives, the chemical properties of ethanol have the potential to cause severe damage to engine systems. Walbro, the manufacturer of the carburetor used on Miniplane engines, warns users in this video about using ethanol blended fuels and how to prevent damage to the carburetor and fuel system. Did the Miniplane marketing environment ever discuss this with Walbro, the supplier of their carburetors? Here are some photos of a carburetor that stopped working due to water and gunk from gasoline with ethanol. In the left photo, water and gunk covers parts of the fuel pump diaphragm. The pump could not do its job. In the right photo, the fuel inlet screen is clogged. This carburetor could not deliver fuel. The pilot was lucky that he did not burn up his engine. I discussed ethanol fuels with Bel-Ray, a manufacturer of 2-stroke motorcycle racing lubricants. They noted that their oils mix correctly with ethanol fuels but warn users that the fuel must not have ethanol >10%. FRAM, a manufacturer of filters, warns users not to use ethanol fuels that have more than 10% ethanol because it will damage their filters. Poulan, a chain saw manufacturer, warns of the serious problems caused by blends with ethanol >10% or which have been contaminated with water. Seastar Solutions, a major manufacturer of marine fuel system parts, warns owners to replace their fuel filters every 50 hours or once a year because of the effects of ethanol in gasoline. They also warn owners that ethanol causes deterioration of fuel system lines, making them hard and brittle from the inside out. Bottom line: Use gasoline without ethanol if you can. The piston pictured below seized as a result of a lack of lubrication. The owner of this Top 80 stated that he added oil to the gasoline in his motor. The likely explanation is that the ethanol fuel had been contaminated with water, causing the lubricating oil to separate out. 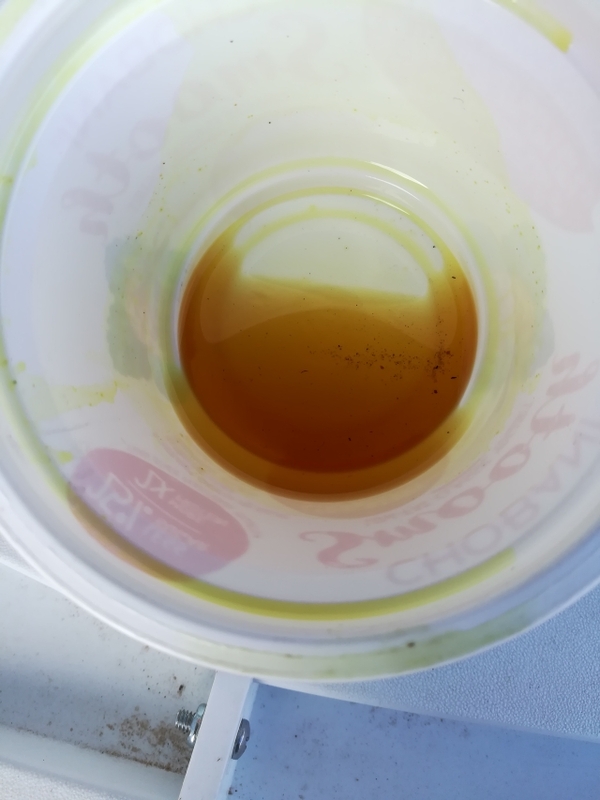 Chris Barker of Royal Purple synthetic oils confirmed in a telephone call to me that water contaminated ethanol fuels will do this. To find sources of ethanol free fuel, go to this site -> http://pure-gas.org. If you find ethanol free fuel at a service station, check it before filling up as it may be mislabeled. Unfortunately, ethanol free fuels are becoming more difficult to find. Note that properties critical to aviation use (for example, vapor pressure and cleanliness) are not controlled to the same degree in automotive motor gasoline manufacture and handling. ExxonMobil aviation does not support or approve the use of Automotive Gasoline as aircraft fuel. If you must use low octane/poor quality fuel, increase the thickness of the washer under the spark plug which lowers the compression ratio of the engine and also lowers the running temperature. Increasing the thickness of the washer can be quickly and easily done by adding a second or third washer from a used spark plug to the existing one. If you get too much spacing, you will not harm anything except lower the engine output. Alternately, the special aluminum spark plug spacer washers (2mm) are available from Miniplane-USA. Poor quality fuels will also vaporize (form bubbles) in the fuel system more readily which will lean out the air/fuel mixture. It is important for pilots to note that automotive service station gasoline (MOGAS) is formulated differently for the cold and hot seasons of the year. We have learned – the hard way – that gasoline refined during the winter months has problems with vapor lock when used in hot weather. That is, the fuel can turn to "fizz" (bubbles) inside the fuel system and cause vapor lock. This will starve the engine of fuel and can cause lean-out under high loads which can damage the engine. Therefore, it is a good idea not to use fuel refined in winter for use in the summer. It does not matter whether fuel preservative is used or not. For those who want more of the science of the problems with vapor lock, Chevron Oil has this helpful article. It is obvious to see why the hot area around the fuel lines and carburetor can cause vapor lock in a paramotor, especially in hot climates. If you want to understand this problem first hand, use a jiggle-siphon to move fuel from an elevated tank to another tank 3-4' below. As the fuel is rapidly moving through the siphon tube, jam the jiggle valve against the bottom of the upper tank and you will see a sudden appearance of bubbles in the siphon tube. This is caused by a negative pressure in the tube which causes the fuel to vaporize and form bubbles. These bubbles in the fuel system will stop the movement of fuel through a carburetor. Aviation gasoline (AVGAS), on the other hand, rarely has issues with vapor lock because of its high quality and that its formulation does not change from summer to winter. Note that most paramotors use a vacuum to pump fuel from the tank to the carburetor, unlike other aircraft. This creates a low pressure on the fuel and it is easier for the fuel to reach its vapor pressure – and form bubbles which block the flow of fuel. High flow rates in the fuel system discourages vapor lock and is why small engines like the Top 80 experience this problem more often than the bigger engines. Unless AVGAS is used, be certain that fuel is fresh (less than 2 weeks old is best). Those who live in humid climates must exercise much greater care when using fuels mixed with ethanol because of the hazard of water contamination. If fuel stabilizer is used, ordinary gasoline can be stored for a year or so (but I would never store it this long). Here is what MOGAS looks like after just a month or two. Fresh gasoline is as clear as water. AVGAS a year old is still clear. All service station gasoline (other than AVGAS) deteriorates quickly and loses its octane value after just a few weeks because of oxidation. If you store gasoline, add a fuel stabilizer like Sta-Bil which can keep it mostly fresh for a year in sealed containers. There is also a product from Sta-Bil that is specifically for fuels used in marine (humid) environments called Marine Formula Sta-Bil. If I lived in a particularly hot and humid climate, I would add this special version of Sta-Bil to my fuel if AVGAS or ethanol-free fuels are not available. Running any engine too hot (lean conditions) will cause the lubricating oil to burn at the lands, including the sides of the piston, due to piston overheating, regardless of what kind of fuel is used. This creates the black gummy deposits which can bind the ring. Red Line (a two stroke oil manufacturer) notes this in one of their technical documents. This piston came from a fuel starved engine which overheated. Even though unleaded fuel was used, the piston was hot enough to burn the lubricating oil that is the surface of the piston. The piston ring was stuck in the lands due to the burnt oil. The pilot flew this engine at the beach. The long vertical gouge was probably caused by a sand grain getting sucked into the engine and then caught between the cylinder and the piston. Cheap fuel/oil, old fuel, and/or ethanol fuels contaminated by water will leave damaging deposits that can find their way into the piston ring and cause it to stick. Another problem with the cheap oils is that they tend to rapidly clog the decompression port, if present, on 2 stroke engines. Lead deposits from AVGAS are not black and gummy but light yellow (lead monoxide) or white (lead phosphate), if TCP or Decalin RunUp is used. Note about increasing the oil mix ratio: Increasing the amount of oil in the gasoline above the manufacturer's recommended value does not prolong the life of the engine. Increasing the oil mix increases the viscosity of the mix and, as a result, leans out the fuel mixture which can cause overheating. Outboard motor manufacturers (e.g. Evinrude, Johnson) recommend increasing the oil mix in new engines. Why not in paramotors? This is because an outboard is water cooled and is virtually impossible to overheat. This is unlike an air cooled engine which are used in most paramotors. 1. Miniplane Thor and Top 80 engines – Full synthetic or semi-synthetic 2-cycle oil at 2% mix (50:1 ratio). Miniplane has reported that using full synthetic oils at the 2% mix ratio may cause engine overheating under certain conditions. It is a good idea to keep an eye, therefore, on your CHT while running the engine. Higher mix ratio – Miniplane allows a 1.5% mix (67:1) for the Top 80 and Thor models if full synthetic oil only is used. I do not recommend it. The brands of oil Miniplane recommends for a 1.5% mix are not available in the U.S. Why use the lesser oil mix? Engines using the 1.5% mix will run cooler and more efficiently because of the lower viscosity of the fuel mix. In addition, the lower ratio has less negative impact on the octane value of the fuel. That is, the addition of oil to the fuel mix lowers the octane value of the fuel. Lowering the octane of the fuel can cause overheating and pre-ignition. We have observed that the 1.5% mix results in a smoother running engine and a small improvement in power output. The downside is that long term use of the higher mix ratio appears to cause premature engine wear2. If you do use the 1.5% ratio, do not use gasoline containing ethanol. You must use either AVGAS or premium ethanol-free unleaded. 3. Fresh Breeze Simonini Mini 2 Plus – Full synthetic oil at 2% (50:1) AVGAS only. Fresh Breeze also prefers that pilots use Castrol TTS oil. Apparently, Castrol TTS mixes well with AVGAS but not with MOGAS containing ethanol. 4. Simonini Mini 2 Plus – The factory version of this engine has special fuel and oil requirements because of different tuning than the Fresh Breeze version. The makers of the following oils state that they meet the JASO FD rating, the highest standard for two stroke oils. You should not use oil that does not meet the JASO FD rating. Oils with lower ratings carbonize at lower temperatures which is why full synthetic oil is the best to use. Semi-synthetic oils that meet the JASO FD rating. The semi-synthetics are considerably less expensive but may not provide the lubrication and resistance to high temperatures of the full synthetic oils. CLEANER – Fully-synthetic oils burn cleaner than the blends which means that cylinder heads and pistons do not need to be cleaned as often. NOT AS PROTECTIVE – A downside to full synthetic oil is that it tends to slip off metal surfaces during storage because of its super slippery nature. This can result in rust forming on those surfaces. It might be important if the paramotor is stored for long periods in a humid environment, like near an ocean. Paramotors and gear stored inside air conditioned environments will always do much better than outside where moisture and condensation can attack metal surfaces. HIGHER MIX RATIO – Can be used at a higher mix ratio because of its better lubricating ability in the extreme conditions that may be found in 2 stroke paramotor engines. COOLER RUNNING – Engines run cooler and more smoothly at higher mix ratios. HIGHER COST – Costs around double the cost of semi-synthetic oils. HIGHER TEMPERATURE – these oils withstand higher running engine temperatures, an important feature that helps prevent piston ring sticking and piston skirt scuffing. NO WATER ATTRACTION – The semi-synthetic blends do not attract water. Pilots who live in humid environments might want to consider this a possible advantage. However, it has been reported that the newer formulations of the full synthetic oils no longer have this problem. COMPATIBLE WITH ETHANOL FUELS – Semi-synthetic oils mix better with ethanol blends. Hirth and Simonini specifically advise not to use full synthetic oils with fuels containing ethanol. LOWER MIX RATIO – Most engine manufacturers do not allow semi-synthetic oil to be mixed at the higher ratios. 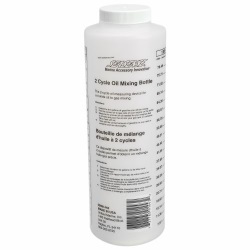 The best mixing bottle is from Shoreline Marine and is sold by Sports Academy and others. It is simple, well marked, and can be sealed to keep dirt out. Some mix their fuel at a lesser ratio than the recommended 50:1 for the Top 80, e.g. 40:1, thinking that it helps lubricate engine parts better or is necessary when breaking in a new Top 80. Both Miniplane and Polini warn against this practice as it can damage an engine due to the increased fuel mixture viscosity which can lean out the fuel/air mixture and overheat the engine. Always be sure to follow the recommendations of the engine manufacturer. Pilots have to resist rumors and hearsay and stick to the engine manuals and information from well-researched sources like this web site. Outboard motors are water cooled and will not overheat! Here is a discussion of what can happen when lower fuel oil ratios are used in engines where this is not recommended. It will lean out the fuel burn and can foul the combustion chamber, including the piston ring, regardless of the type of gasoline used. Minari has this note in their user manual, "WARNING: Please note that an excessive amount of oil does not stretch the life of the engine. a wrong quantity of oil leads to seizure." That is, too much oil in the gasoline can cause overheating in some engines. Polini has this note in their user manual for the Thor engines, "...mixes that contain too much oil do not extend the engine’s life." Everything depends on how the engine is engineered and the jetting used in the carburetor. Do not experiment with the fuel/oil ratio but do just what the manufacturer specifies. Per Miniplane's recommendation and the experience of many pilots, it is always best to mix small quantities of oil and fuel just before use and not store the mix more than (2) weeks no matter what kind of gasoline is used. The lubricating properties of the oil are affected by long term contact with any kind of gasoline, with fuel additives, and especially with ethanol blends. I mix fuel and oil (2) gallons at a time. It is a nuisance but it means my fuel mix is fresher. Always fly safely and courteously. 1As of November 2018 – There has been no response to my questions (4th paragraph below) from Miniplane. In July 2018 Miniplane released this cryptic, unsubstantiated bulletin (next paragraph below) concerning the use of AVGAS in the Top 80. The marketing department apparently made most of this up or confused the warnings about ethanol in gasoline from Walbro with AVGAS. "...although in our user manual we have never recommended the use of AVGAS, many customers have decided to use it following, according to current consuetude [sic], information randomly collected from the web. This type of fuel has never been tested by us and we can not guarantee that it can not cause problems, not least that of a poor compatibility with the oils that can be easily purchased in the motorbike, boat, etc. market. In any case, as explained on many occasions, the use of AVGAS is not necessary for the operation of the engine, at the moment we are not able to confirm, even if we suspect it, that it is even harmful. One reason why we are now certain that we can advise against its use is that we have received a warning from one of our suppliers, he confirms that AVGAS gasoline causes problems to some components of the petrol circuit and consequently to the engine. No problem for lead-free commercial gasoline, or with alcohol up to 20%, in this case, however, we advise you to check the compatibility of the oil." "Poor compatibility with the oils"? What's the chemistry here or where is the reference? "Easily purchased [2 stroke] oils [for a paramotor]"? The Miniplane marketing department has obviously never been to the U.S. which has next to zero 2 stroke motorbikes, etc. on the roads. Which components in the fuel system? What did it do? What parts of a Walbro carburetor would AVGAS damage that MOGAS would not? Why doesn't Walbro note this in their service bulletins if AVGAS will harm their carburetors (which they do not)? In over ten years of AVGAS use, our group in the southwest has not experienced any damage to the fuel systems or engines other than the usual damage done by all gasoline i.e. aging of fuel lines and diaphragms. What is the mystery component in AVGAS that does this? AVGAS is 100% petroleum but not MOGAS which contains the powerful solvent/oxidizer ethanol, a simple alcohol. 2 stroke oils may have incompatibility with ethanol but not with any 100% petroleum product like AVGAS. Also, our MOGAS is not the same as that in Europe. Has Miniplane tested U.S. oil brands and fuels? Not likely. What part does the supplier make? It is possible that Miniplane has a new part in the fuel system that may be affected by the mystery additives in AVGAS but which? The formula for AVGAS is easily available and is the same worldwide because mistakes in its making could kill people. Perhaps to save money, Miniplane fuel tubing is made from recycled Walmart bags that do not respond well to tetraethyl lead. But such tubing would also be dissolved by the ethanol in cheaper MOGAS. In sum, what Miniplane has written above is vague and not helpful. How does anyone check "the compatibility of the oil"? What are the criteria? AVGAS stores forever (unmixed) and has the highest standards of manufacture of any fuel. For this reason (and that it is ethanol free) we use it in our very hot environment, despite its high cost. Why hasn't Miniplane tested AVGAS, a simple and easy thing to do (the environmentalist whackos would, of course, frown on such a test). As a degreed organic chemist once-upon-a-time, yours truly is surprised by the bulletin. I have contacted Miniplane and am trying to find out what they are talking about and will let everyone know. They will never let anyone connect with the engineers so we have to deal with marketing departments (a.k.a salesmen) who only have one goal: sell more of whatever it is and not anger the "green" lobby. I am not optimistic in getting an honest answer from the Italians. 2CAUTION! I no longer recommend using a 1.5% mix even if the engine manufacturer allows it. It appears that the higher mix ratio may increase wear of the upper connecting rod bearing and wrist pin in a test engine that had been run exclusively at the 1.5% mix for over 300 hours. This part of the engine has the poorest lubrication which may be why the increased wear with the higher fuel/oil mix ratio. However, this is conjecture as I have not done any sort of extensive testing on multiple engines.